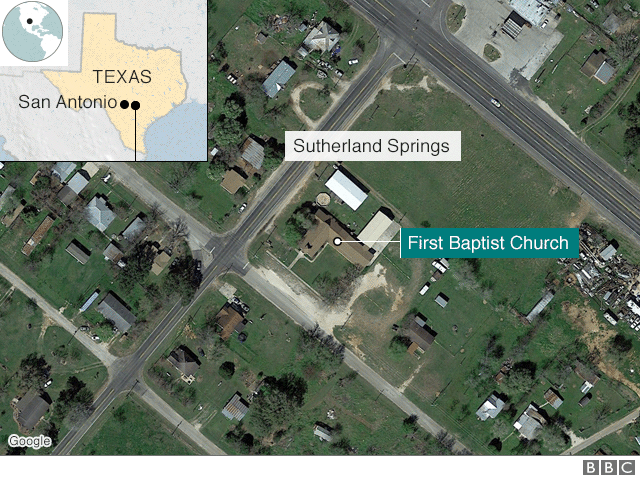 At least 27 people have been killed after a gunman opened fire at a church during Sunday services, police say. “The details are kind of sketchy but what I know right now, what they’re telling me, like 27 deceased and over 20, 25 injured,” Mr Gamez Jr said. About 50 people usually attend the service, locals said. Local media outlets reported that children were among the dead. 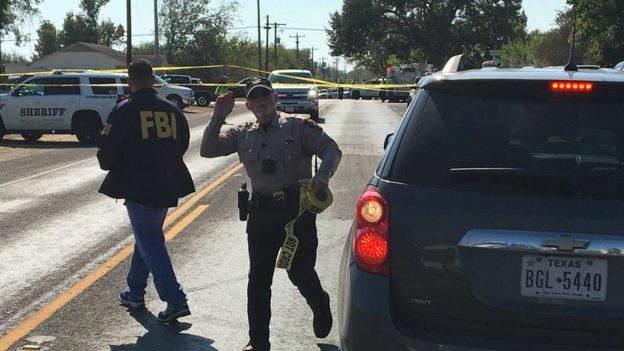 The gunman died after a brief car chase into nearby Guadalupe County slightly to the north, a Sherriff’s Office deputy from that county told CNN. But it is not clear if he was killed by police or killed himself, the spokesman said. The pastor and his wife were out of town at the time, the pastor of neighbouring River Oak Church told KSAT 12. “We were in the middle of our church service down the road when we got phone calls from friends about this – and they said there was an active shooter at First Baptist Church,” he said. “We had some first responders in our church, who immediately left and went down there. And then my church went to do what we do – we started praying… we knew the best thing we could do was stay out of the way”. He said people had been told some news which was “private and personal for the families that are here… we cannot release any of that”. Sutherland Springs is a small town with just a few hundred residents, which lies about 50km (30 miles) southeast of the city of San Antonio. The San Antonio FBI branch said its agents had been deployed, and there was no indication of the gunman’s motive. The FBI also said that while only one shooter was reported, it was looking into other possibilities. Photos and video from the scene showed the area taped off by local law enforcement. A number of helicopters have arrived to transport the wounded, KSAT 12 reporter Max Massey said. He said more details would be released by the Texas Department of Public Safety shortly. President DonaldTrump, on a tour of Asia, tweeted: “May God be with the people of Sutherland Springs, Texas. The FBI and law enforcement are on the scene. I am monitoring the situation from Japan.